Iowa Senator Joni Ernst says she is pleased to see the five-year Farm Bill passed even though there are some compromises in the bill. The Republican from Red Oak voted for the bill, while fellow Senator Chuck Grassley voted against it. “I know that Senator Grassley had his own concerns and the reasons for why he voted the way he did — and that’s okay. Sometimes Senator Grassley and I do vote differently on different types of bills,” Enst says. Grassley said he was disappointed that the limits on farm payments weren’t strong enough and benefited large corporate farms the most. 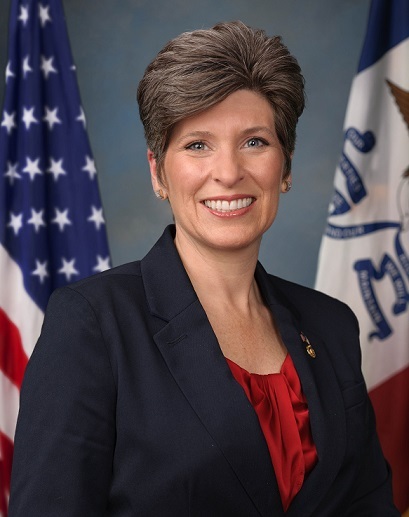 Ernst says she is concerned about some of the circumstances that Senator Grassley pointed out. “We just need to find a better way at targeting that. So, I appreciate Senator Grassley and his hard work in this area, I think it was really important,” she says. “But overall I did support the bill because I think there are a lot of really good things in there and a lot of supports that our farmers needed,” Ernst says. Ernst says she is also happy to see the replacement of the 2015 Environmental Protection Agency (EPA) rule regulating waterways known as the Waters of the U.S. or WOTUS rule. Supporters of the rule say it will set back efforts to make waterways cleaner — but Ernst doesn’t agree. The focus has been on the runoff from farms that flows into waterways — including concerns about the so-called “dead zone” in the Gulf of Mexico that researchers say is caused by nutrient runoff. Ernst says farmers have been working to improve the water quality. “We’ve seem significant progress I guess is what I would say in my estimation with the education that we have been providing through various sources. Whether it’s through Iowa State Extension, through the Farm Bureau , there are ways that we can use conservation programs — the buffer strips and so forth — that allow for regular drainage off the land that is filtering the water as it moves towards those navigable waters,” Ernst says. She says the WOTUS rules implemented during the Obama Administration went too far in trying to regulate any standing water. “Where if you did have a small puddle or a farm pond that would be regulated by the federal government. That to me does not make sense,” Ernst says. Ernst and Senator Grassley had both urged President Donald Trump to scrap the rule.